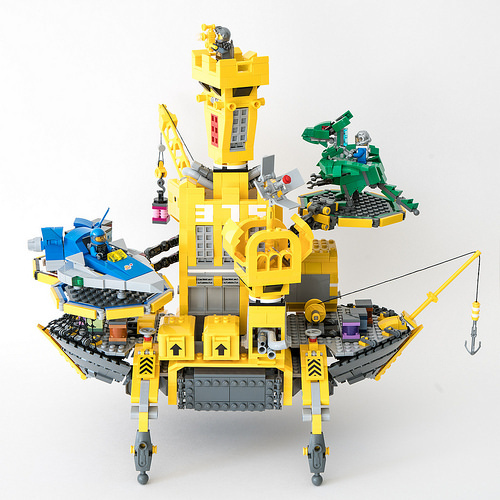 The recent BrickCon 2017, which took place in Seattle just a month ago, gathered the best Back to Old School creations — some of the most awesome remakes and remixes of old LEGO themes and sets. Galaktek‘s color refinery is an adorable reflection upon old concepts when designs were simple and the color palette is limited by several basic colors. That’s why you’ll never find here pieces in dark purple of Maersk blue; it was a beautiful time of yellow castles and blue and grey spaceships! Although there are traces of other colors in the background containers. Sort of makes me think as purple color in the Roman empire. It was the hardest and most difficult color to obtain for dying clothes, and since it was officially sanctioned as the color of the elite, it would even be a subversive act to wear it, if you could afford it.